Students of SIES GST are recommended to complete their profile with the college name to be eligible for prizes. Problem 2 Test Cases are fixed. Solutions will be rejudged. Problem issues with GSJANB have been fixed. Solutions will be rejudged at the end. 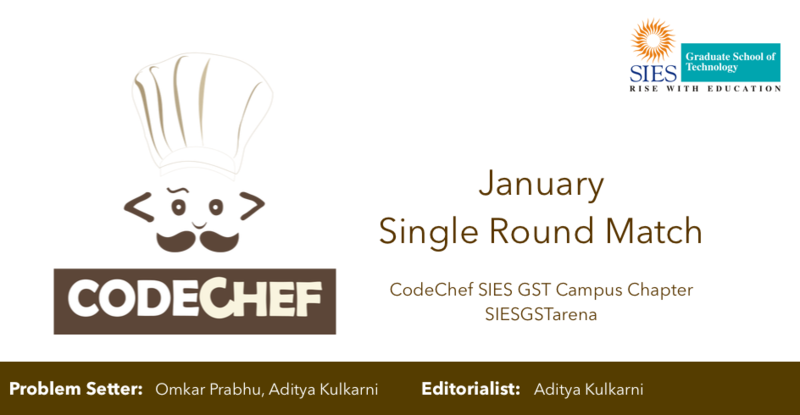 This is the first contest of CodeChef SIES GST Campus Chapter. We are trying to seed the Competitive Programming Culture at SIES GST. There will be a Single Round Match every month.